The Green Party has been a steadily growing force in Canadian Politics over the past decade. This has taken place despite a political environment which is volatile and hostile to newer parties. For example Canada operates under the prohibitive single seat electoral system, which has prevented the Canadian Greens from winning seats in previous elections. This has resulted in politics being dominated by the right wing Conservative Party and centre left Liberal Party, with a smaller Quebec separatist Party also represented. In recent years Canada has also seen a political drift to the right, with a Conservative Government elected in 2006 dismissing the threat of climate change. In this context, there was an opportunity for the Canadian Greens to be a new, strongly pro-environmental alternative to those disillusioned with the status quo. In the 2008 parliamentary election this paid off, with a vote of 6.8% (from 4.5% in 2006) but, unfortunately, no seats. The Canadian Greens therefore changed tactics, deciding to target their resources at only a handful of constituencies. This paid of this year when they won their first seat, but it came at a cost. In this article, we look at the tactics adopted by the Canada Greens and what Green campaigners can learn from them. The 2008 election results brought about a big increase in public funding, which gave the Canadian Greens a lot more resources at their disposal. Their objective however remained to win that elusive first seat in the Canadian Parliament. In 2009 they began drafting a campaign strategy with this objective at its core. It was decided that their only way into Parliament would be for Elizabeth May to identify a constituency to run in early, and spend a considerable amount of time and resources building up a local profile and record for her. The Constituency that was chosen was located in the far western end of the country, at a rather inconvenient distance from the political centre of the country in Ottawa. However it had recorded a strong Green vote in 2008, and so was the best chance for a breakthrough. Elizabeth spent three out of four weeks there from 2009 onwards, working on the ground with campaigns and indentifying voters. 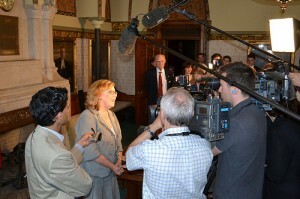 As a result of her absence from Ontario, her profile nationally, and that of the Greens, suffered. It also presented difficulties unique to Canada during the election itself, as the considerable time difference (3hrs) made planning morning interviews quite difficult! All resources, time and money, were focused on this target constituency. Whatever resources not targeted at this constituency were directed at constituencies where the Greens had polled well in 2008 (i.e. over 10%). One major difference between the 2011 and the 2008 election was the exclusion of the Green leader from the election debate. The decision was ostensibly taken by the four major broadcasting corporations, independent of political pressure from the main parties. The main parties claimed in public that, on the contrary, they would have no problem with Green participation. This was a major setback for the Greens, as the election debates provided an occasion to reach undecided voters who otherwise might not follow the daily election campaign. It was therefore crucial that the Greens used whatever means possible to fight back, meaning a large amount of their energy was directed towards this issue. There first step was to take the broadcasters to Court, which resulted in the broadcasters having to disclose reasons as to why the Greens were excluded. The appeal failed however, and was a costly exercise for the Party. The Canadian Greens also adopted grassroots, low-cost campaigning, to highlight the discriminatory actions of the media elite. Their youth wing held mock theatrical debates outside the TV studios, portraying the Greens as being physically excluded by the broadcasting corporations. There was also a major petition organised. This resulted in the issue remaining a part of the election coverage, compensating from the Greens exclusion from the debate. During the debate itself, the Greens held a simultaneous ‘online debate’ where Elizabeth gave Green responses to the questions being asked during the debate. This was covered by some of the smaller newspapers and online media outlets, and proved a low cost way of compensating (somewhat) for the exclusion from the debate. As well as targeting electoral constituencies, the Canadian Greens also targeted demographic constituencies. The first step in this process was the somewhat expensive process of conducting research into which voting blocs were susceptible to the Green message, which determined that educated, young and liberal voters should be a key target for the Party. Social media proved an effective means of reaching these groups, and formed a major component of the Canadian Green’s campaign. A substantial portion of their €1.5m budget was dedicated to online media, which allowed them to target their advertising more precisely than more traditional methods would allow. However some of their methods can be adopted by even Green Parties on a tighter budget. For example, generic tweets and status updates were provided by campaign headquarters, which gave candidates easy to use content for their online profiles. The Canadian Greens also produced an ‘app’ for supporters’ smart phones which kept them updated with the campaign and allowed users to easily donate money. It was eventually downloaded by 4,000 people. The exclusion from the debate, and a surge of support for the left wing New Democratic Party, resulted in a fall of support for the Canadian Greens from 6.8% to 3.9%. However, they succeeded in getting their first ever seat, in an election which saw major changes to the composition of the Canadian Parliament and two party leaders lose their seats. The gamble of targeting resources at one constituency, however much it may have harmed their national profile, seems to have paid off, as Elizabeth has become a high profile and energetic voice in Parliament. The secret now is to grow the Party beyond a single seat, which will remain a challenge under Canada’s difficult voting system. However the tactics of targeting will remain central to this. An outstanding example for a long-term strategy to gain a seat in parliament under an electoral law that prohibits smaller parties from entering the system. The candidate and the party must have suffered a lot. I can imagine the power that it had cost internally to focus on this first single seat – and at the same time reduce national visibilty and risk diminishing support. Well done, congratulations! … and best wishes for the next seats to be won!